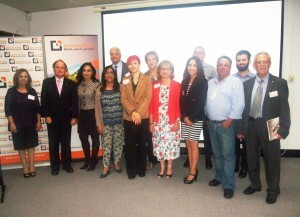 Arab Council Australia (ACA) held its Annual General Meeting (AGM) and launched the Strategic Plan 2016-20120, on Thursday 31 March 2016 at ACA Bankstown. In the presence of: The Honourable Mr David Clarke MLC- Member of the Legislative Council-Parliamentary Secretary for Justice and representing the Minister Hon John Akaka-for aging-Minister for Disability Services-Minister for Multiculturalism; His Excellency Mr Ahmad Ait Issa-Minister of the Embassy of Morocco Canberra; Superintendent Dave Eardley-Commander Bankstown Local Area Command; Ms Melissa Johnston-Principal of Granville South Creative & Performing arts high School; and Ms Don Issa-Dupty Principal of the same school. More than a hundred people of Council members, guests, and heads of organizations, business owners, writers and artists, media representatives and community supporters attended the function. 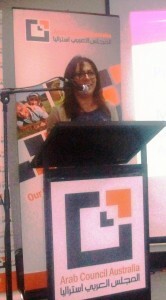 Marcelle Mansour (Visual Artist and Writer of this article) performed the Master of Ceremony (MC). 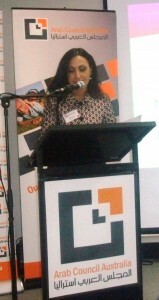 She gave an elaborate introduction to the Arab Council Australia’s history and reflected on the efforts made in the past years. Marcelle explained how she is connected with this dynamic organization and its people for a long time, and described how the Council has grown significantly over the years and has taken new directions and initiatives that are responsive to the changing community environment. 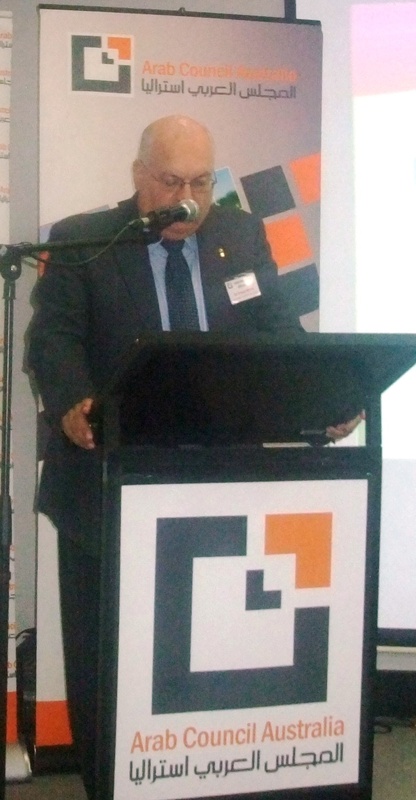 The event commenced with the launch of Council’s Strategic Plan 2016-2020 by the honourable David Clarke MLC, then the reconvened the 2015 AGM. 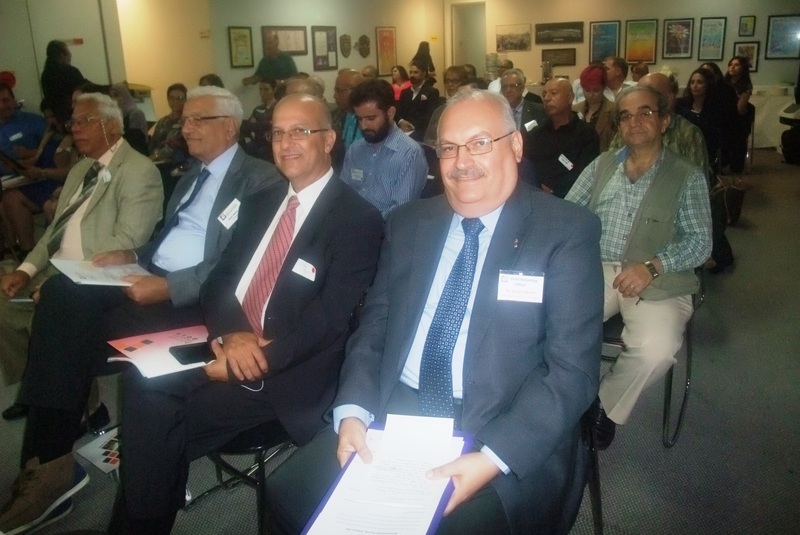 The first part was held on 16 December 2015. On 31s of March 2016 was the second part of the 2015 AGM and Council reconvened it to present the full report about Council’s activities and elect a new Board and to launch Council’s new Strategic Plan for 2016 – 2020. Hopefully, the Council will hold its AGM 2016 in the final half of this year. 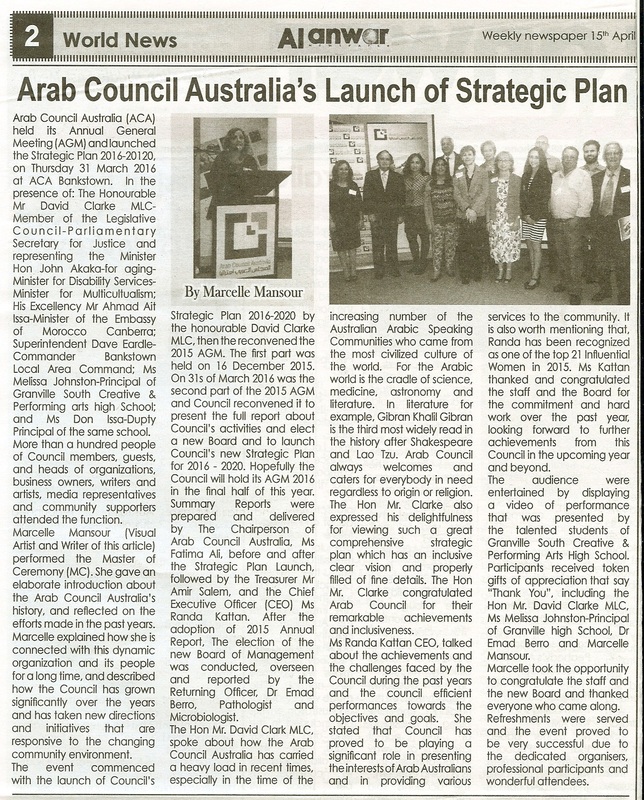 Summary Reports were prepared and delivered by The Chairperson of Arab Council Australia, Ms. Fatima Ali, before and after the Strategic Plan Launch, followed by the Treasurer Mr. Amir Salem, and the Chief Executive Officer (CEO) Ms. Randa Kattan. After the adoption of 2015 Annual Report, The election of the new Board of Management was conducted, overseen and reported by the Returning Officer, Dr. Emad Berro, Pathologist, and Microbiologist. 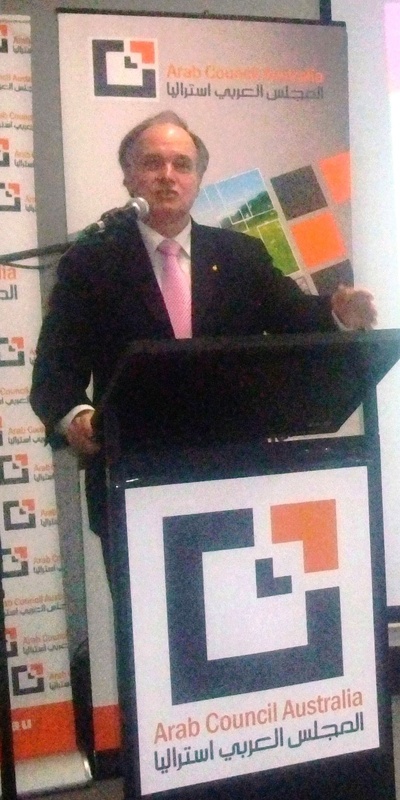 The Hon Mr. David Clark MLC spoke about how the Arab Council Australia has carried a heavy load in recent times, especially in the time of the increasing number of the Australian Arabic Speaking Communities who came from the most civilized culture of the world. For the Arabic world is the cradle of science, medicine, astronomy, and literature. In literature, for example, Gibran Khalil Gibran is the third most widely read in the history after Shakespeare and Lao Tzu. 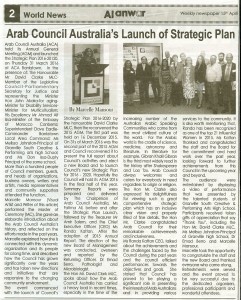 Arab Council always welcomes and caters for everybody in need regardless of origin or religion. The Hon Mr. Clarke also expressed his delightfulness for viewing such a great comprehensive strategic plan which has an inclusive clear vision and properly filled with fine details. The Hon Mr. Clarke congratulated Arab Council for their remarkable achievements and inclusiveness. Ms. Randa Kattan CEO talked about the achievements and the challenges faced by the Council during the past years and the council efficient performances towards the objectives and goals. She stated that Council has proved to be playing a significant role in presenting the interests of Arab Australians and in providing various services to the community. It is also worth mentioning that, Randa has been recognized as one of the top 21 Influential Women in 2015. Ms. Kattan thanked and congratulated the staff and the Board for the commitment and hard work over the past year, looking forward to further achievements from this Council in the upcoming year and beyond. The audience was entertained by displaying a video of the performance that was presented by the talented students of Granville South Creative & Performing Arts High School. Participants received token gifts of appreciation that say “Thank You”, including the Hon Mr. David Clarke MLC, Ms. Melissa Johnston-Principal of Granville High School, Dr. Emad Berro and Marcelle Mansour. 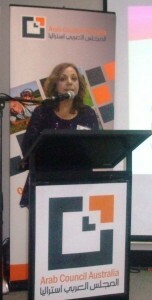 Marcelle took the opportunity to congratulate the staff and the new Board and thanked everyone who came along. Refreshments were served and the event proved to be very successful due to the dedicated organisers, professional participants, and wonderful attendees.